Het gemeentebestuur van Dubai en Philips Lighting zijn per direct gestart met de verkoop van de Dubai-lamp, ’s werelds meest energie-efficiënte commercieel verkrijgbare led-lamp. De introductie is onderdeel van het Dubai Lamp Initiative, een partnerschap tussen Philips Lighting en het gemeentebestuur van Dubai. Het initiatief benadrukt de inzet van Dubai om ’s werelds duurzaamste stad te worden. De Dubai Lamp is verkrijgbaar in 4 varianten met een vermogen van 1, 2 en 3 watt en is te koop in de drie belangrijkste supermarkten van de stad. Met deze uitvoeringen kan de Dubai Lamp 80 procent van de conventionele lampen vervangen die gebruikt worden in woningen in Dubai. Het gemeentebestuur van Dubai en Philips Lighting willen nog dit jaar 2 miljoen Dubai Lampen leveren aan inwoners en bedrijven in de stad. Available in key supermarkets across United Arab Emirates starting May 27th 2017. Dubai Municipality and Philips Lighting have partnered to create a breakthrough innovation in LED technology. Dubai lamp the most energy effecient light bulb in the world aims towards contributing to a more sustainable world for future generations. Dubai Lamp includes a range of four lamps that are most commonly used in homes, consuming only 1,2, and 3 Watt. Dubai Lamp is available in four models – both in cool daylight and warm white colors. Candle 1 Watt with a light output of 200 lumen, this lamp can replace a 25W incandescent candle lamp, for example in chandeliers. Its filament LED technology gives the same decorative impression as the original incandescent lamps. The lamp is available in warm white and cool daylight. The lifetime is 15,000 hours. The lamp has an E14 base and is not dimmable. Bulb 2 Watt with a light output of 400 lumen, this lamp can replace a 40W incandescent bulb, for example in decorative fixtures or areas where not much light is needed. 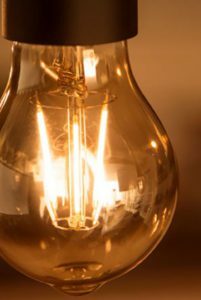 Its filament LED technology gives the same decorative impression as the original incandescent lamps. The lamp is available in warm white and cool daylight. The lifetime is 15,000 hours. The lamp has an E27 base and is not dimmable. Bulb 3 Watt with a light output of 600 lumen, this lamp can replace a 60W incandescent bulb, in the most common areas in the house. Its filament LED technology gives the same decorative impression as the original incandescent lamps. The lamp is available in warm white and cool daylight. The lifetime is 15,000 hours. The lamp has an E27 base and is not dimmable. Spot 3 Watt with a light output of 420 lumen, this lamp can replace low-voltage halogen lamps of 35W or 50W, for example in small recessed spotlights. The lamp has new LEDs and a newly developed driver on board to make it compatible with most of the commonly used transformers. The lamp is available in warm white and cool daylight. The lifetime is 25,000 hours. The lamp has a GU5.3 base and is not dimmable. Dubai lamp is available only in the United Arab Emirates at the below retailers: Carrefour Supermarket, Lulu Hypermarket and Geant Supermarket.